Team to beat: Great Oak (SS). Jesuit junior Matt Strangio was fourth last year as a sophomore. He then went on to gain revenge in the 3200 at the State Track Finals, overcoming D-I XC champion Justin Hazell in the final strides. While Strangio's fall season was interrupted by injury, he appears to be all the way back, which is bad news for the rest of the field. And that group includes Long Beach Poly senior William Frankenfeld, who took off toward the end of the Southern Section final on Saturday and that surge propelled him to a section title. Great Oak's Oklahoma-bound senior Tyler Tickner overcame a nasty fall to rally to place second. But the energy spent in his comeback sapped any reserves to counter Frankenfeld's kick. A fully healthy and upright Tickner very well could find himself in the hunt with Strangio. hitting the final stretch grass at Woodward with only a final sprint to a championship. Others to watch include Dana Hills senior Simon Fuller (13th last year), Los Altos senior Owen MacKenzie, Stockdale senior Marcus Mota (the Central Section champion), Palo Alto's Henry Saul (Central Coast Section champion), the West Ranch senior duo of Isaiah Seidman and Evan Bates, Trabuco Hills senior Josh O'Neill, Mira Costa senior Cy Chittenden, and senior Ryan Shields among the pack of Great Oak front-runners. Do not count out Isaiah Galindo of Clovis North as well. Perennial champion Great Oak had to sub out two of its regular seven last week because of injury and still beat runner-up Dana Hills by 43 points. They will be without those two once again, but just like Chris Verdugo did at Mt. SAC (15:00) and Ryan Shields' performance at the SS-Finals (14:46), one hardly notices as it seems that uniform does not discriminate! Solid victories over impressive fields at Woodbridge, Bob Firman, Clovis, and last weekend's SS-Finals have many believing that they are the best in the nation! Like they have the past four seasons, Great Oak should capture another Division I State Championship. With West Ranch being off in that crucial fifth scoring slot, combatted with Dana Hills' best performance of the season, these two will battle once again but should both make the podium (top three). Dana Hills' has the tradition over always showing up with their best as they were runner-up to Great Oak three times from 2014-2016 while claiming third place spot last year. 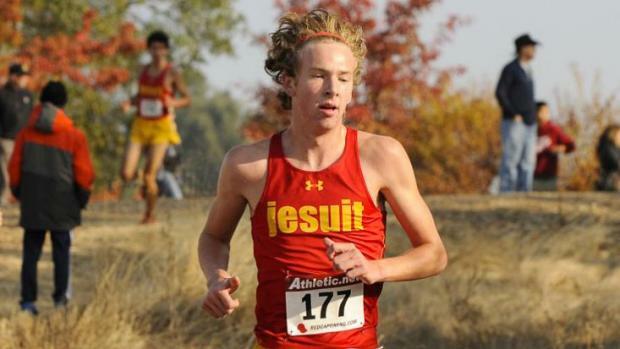 Now fully healthy, Sac-Joaquin Section Champs, Jesuit look poised to surprise and break into the top three. But, North Coast section champions, Dublin, are right there with them. The Dublin Gaels were runner-up in Division II at last year's State Meet and are led by Loic Scomparin and Christopher Middleton-Pearson. Central Coast Section Champions, Bellarmine Prep will also be in the mix along with Long Beach Poly. Bellarmine is led by sophomore Colin Peattie. Others seeking a top ten finish are Amador Valley, Paso Robles, and the up-start Mira Costa crew that surprised at the SS-Finals by finishing sixth, despite being ranked 14th going into the postseason. Nearby Clovis North will also pose a challenge with their upfront firepower.